Stones have been fascinating me since childhood: the pebbles on the bed of the river where I used to play; the sparkle of the gemstones in my mother’s jewellery. Every stone is unique and holds a secret. A stone can be your helpful friend, bringing you happiness good fortune) and fulfilling your dreams. Later I encountered the power of mandalas and the medicine wheels of indigenous peoples. 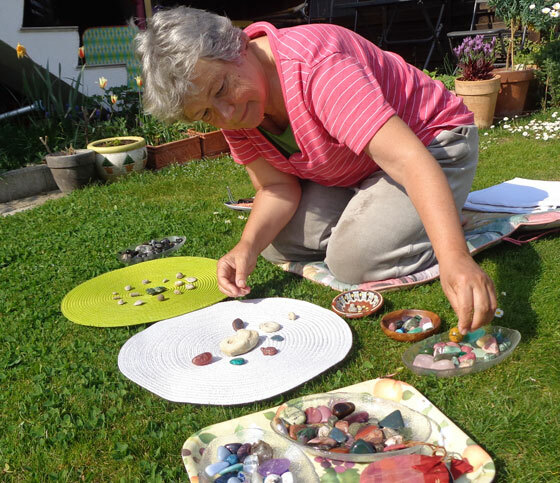 These inspired me, so I began to create stone circles or even stone mandalas on behalf of various countries to provide an impulse towards peace. You can find them on Google Plus. My friends asked me for a photo of these stone mandalas that they could hang on the wall to help towards a more positive energy in their homes, or to benefit their relationships. Since 2010 I have been creating slide-shows to use as self-healing meditations on YouTube and Vimeo, or to purchase as DVDs. That’s how it goes: once the stones have entered your life, they love to fill the space!